A display to inform beachgoers about the dangers of sun exposure and UV levels in real time has been set up at both Weed Beach and Pear Tree Point Beach. Here’s the display, which gives real-time information on the intensity of the sun at the beach. 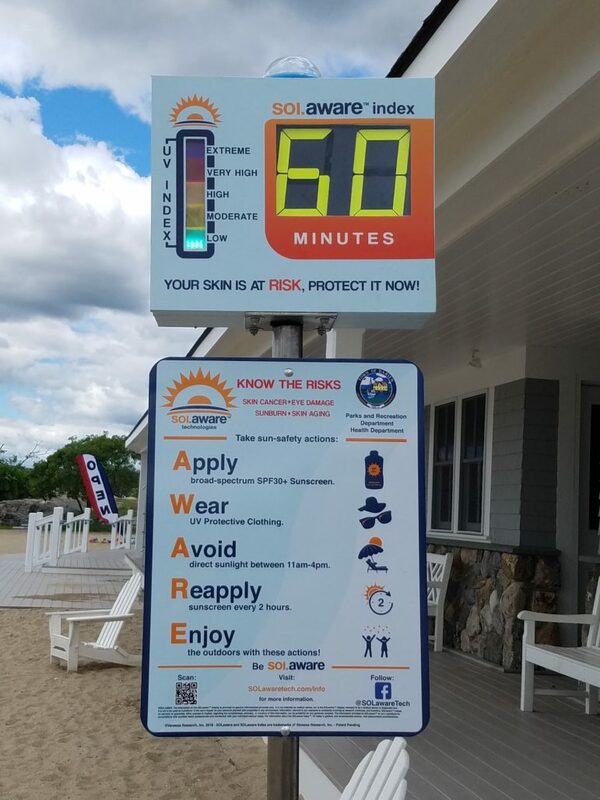 The “modular sun safety education system,” also shows information on recommendations to protect yourself from dangerous levels of sun exposure, according to an announcement from the Darien Parks & Recreation Department and the company that created and donated the display. Darien is the first town to receive the innovative products as part of the SOLaware Technologies’ summer pilot program in Connecticut. Darien Health Director David Knauf worked to get Darien as a participant in the pilot program, resulting in the town becoming the earliest partner to get the displays, according to the announcement. “Sun safety is one of my priority educational areas as health director, and the SOLaware solution is a great way to raise awareness within our community,” Knauf said. Darien Parks & Recreation Director Pamela Gery said she’s happy to get the displays for the beaches. SOLaware Technologies team delivers its first device displaying real-time sun-exposure information. Company representatives are shown here with Pamela Gery, director of Parks and Recreation, Health Director David Knauf and Jami Dawson, town recreation supervisor. Be prepared for Spring and Summer: Beach permits, boat-launch stickers and registration for April Vacation Camp and a safe boating class are all now available from the Darien Parks & Recreation Department. — an announcement from the Darien Parks & Recreation Department Beach Permits, Boat Launch Stickers The Parks and Rec Department is now selling 2019 park permits and boat launch stickers. Starting Tuesday, July 10 and continuing every Tuesday into September, Darien Library presents "Stories by the Sea," a storytime program for kids at Weed Beach. This is a family storytime for all ages, according to the library's announcement. Pingback: Be SOLaware™ - Open your eyes about sun exposure!